Jackie Robinson espoused courage, determination, teamwork, persistence, integrity, citizenship, justice, commitment, and excellence as core values. The initiative encourages promotion of these values by all parties involved in this regional character-building effort. Robinson's declared "nine characteristics to live by" are printed on weatherproof signs for display by participating schools. 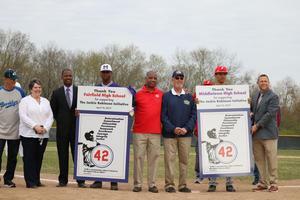 The first 100 Greater Cincinnati area baseball and girls’ softball programs that participate in the program will receive Jackie Robinson signs to place on their schools’ backstops. Each school will also receive 25 complimentary Reds tickets for its varsity team. The Nuxhall Foundation represents three initiatives begun by Reds Hall of Fame broadcaster Joe Nuxhall, including the Joe Nuxhall Miracle League Fields, the Joe Nuxhall Character Education Fund, and the Joe Nuxhall Scholarship Fund.